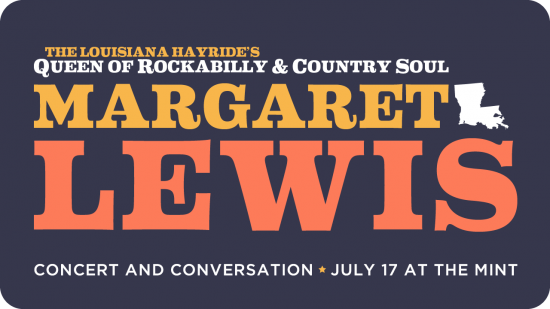 “Shreveport could have been another Nashville.” So declares singer, songwriter, and music entrepreneur Margaret Lewis, the West Texas-born songbird who got her first big start in 1957 with an invitation to appear on the Louisiana Hayride. The glory days of the nationally broadcast Hayride – which launched the careers of Hank Williams, Johnny Cash, Elvis Presley, Johnny Horton, Kitty Wells, and countless others – are over, but you can catch Lewis, now known as Margaret Lewis Warwick, at this Tuesday’s edition of Heroes of Louisiana Music at the Mint. In Shreveport, Lewis formed a partnership with the equally legendary Mira Smith, a songwriter and guitarist who owned the local label RAM (short for “Royal Audio Music”). Between 1959 and 1961 Lewis cut numerous country and rockabilly singles on RAM, including “Cheaters Never Win” and “Shake a Leg,” and later signed with Capitol. She and her sister toured as backup singers for Dale Hawkins, performing on some of his Chess sides. She also forged a songwriting partnership with Smith, hitting with “I Almost Called Your Name” for Margaret Whiting and “Mountain of Love” for David Houston. In 1966 the duo moved to Nashville, signing on with Shelby Singleton’s SSS Productions and cranking out a slew of major hits: “Soul Shake” for Peggy Scott and Jo Jo Benson; “Country Girl” for Jeannie C. Riley; “Wedding Cake” for Connie Francis; and the country-soul classic “Reconsider Me,” which charted for New Orleans’ own Johnny Adams as well as Narvel Felts. Lewis has had more than 100 songs cut by artists such as Dolly Parton, Loretta Lynn, and Conway Twitty, and two of her songs are included on the 2005 Grammy-winning compilation Night Train to Nashville. Lewis married Smith’s cousin, Alton Warwick, in 1981 and eventually returned to Shreveport, where her efforts helped spare the fabled Municipal Auditorium from the wrecking ball. She has served as chairwoman of the Louisiana Music Commission, and in 2009 she received the Offbeat magazine award for lifetime achievement. She currently performs with her group The Thunderbolts and most recently produced the Louisiana Hayride’s Bicentennial Bash. Come see this queen of rockabilly and country soul perform and reflect on her storied career with music writer Michael Hurtt this Tuesday July 17th, 2012 at 6 p.m. at the Old Mint, 400 Esplanade Ave, New Orleans, LA 70116. The show is sponsored by the Ponderosa Stomp Foundation and The Friends of the Cabildo.